According to Board Officials BISE Multan Board 10th Class Result 2019 will announce on 21 July, 2019. BISE Multan conducted Matric 10th Class Exams 2019 in March and now students of matriculation are waiting for the result. Student’s matric result will be declared nearly mid of July 2018. So keep calm and visit the same page to get further updates. 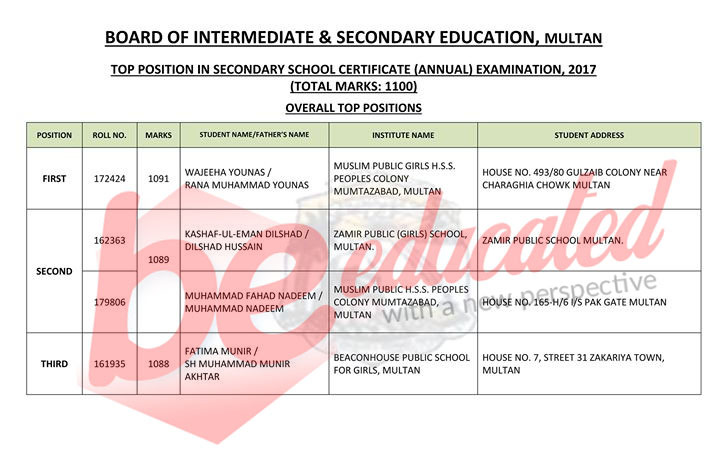 Board of Intermediate and Secondary Education Multan has announced the result of matric 2019 and has also declared the position holders in each group who have marked the success among their name. The Chairman of BISE Multan Board led the press conference and declared the names of the students in the list of top three position holders. The students who have holds the first-three positions in the SSC part-2 matric exams 2019 in science group among girls are Wajeeha Younas as she stands first with 1091 marks, Kashaf-ul-Emaan Dilshad plunge second position with 1089 marks while Fatima Munir grabbed the third position with 1088 marks in annual board exams. 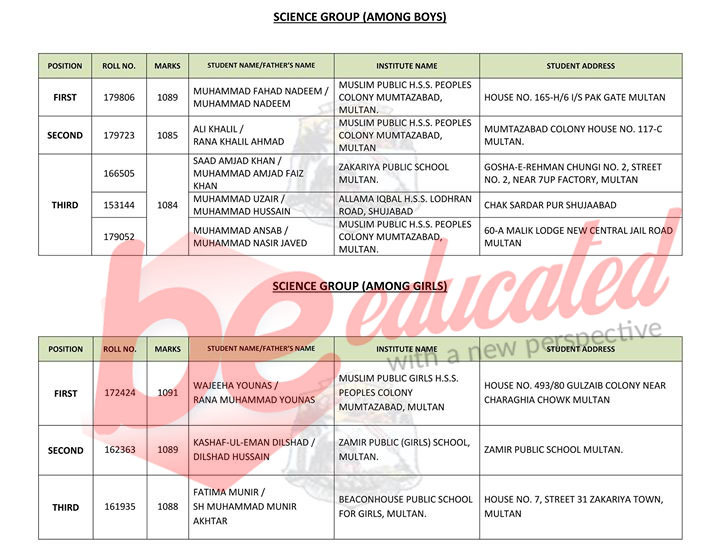 Whereas the boys from science group didn’t breathe less towards the ocean of positions as we can see that Muhammad Fahad Nadeem scored 1089 marks with first position, Ali Khalil scored 1085 with second position, while Saad Amjad Khan, Muhammad Uzair, and Muhammad Ansab these trio scored with 1084 marks as holding the third position. 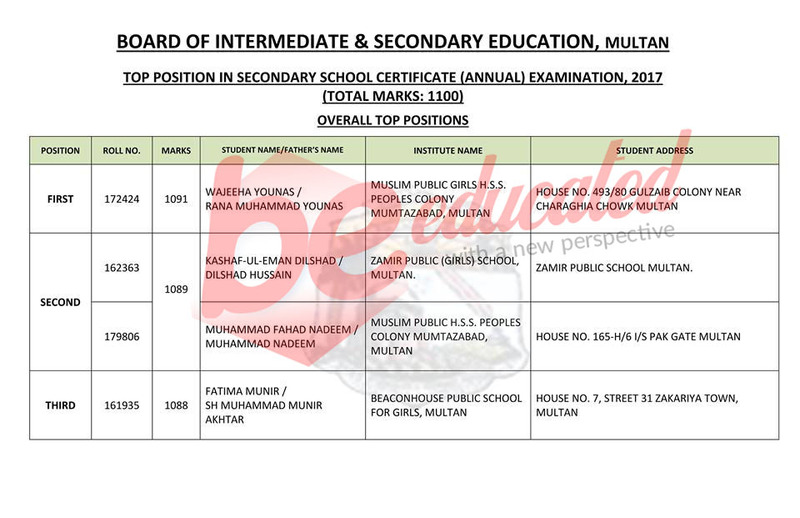 Board of Intermediate and Secondary Education Multan has announced the result of matric 2018 and has also declared the position holders in each group who have marked the success among their name. NOTE: BISE Multan will announce the 10th class results in the mid of July and we will also update the result on our website. last year BISE Multan Board SSC part 2 result 2018 wias announced on July 25th at 10:00 am. The result was also uploaded at the official website of educational board. All those students who were appeared in exams and now are waiting for their results impatiently are advised to keep in touch with us to get all the latest updates. We wish good luck to all the result awaiting candidates and advised them to and stay with us for result recent updates. BISE Multan Board annually organizes matric and inter level exams. Millions of private as well as government sector students annually register with Multan board. By the quality of education Multan board becomes the most famous board in its affiliate areas and in the province as well. The board is also responsible for arranging exams of CT, PTC and OT courses. The duration of these courses are one year. This educational board is working under the ministry of education. In 2019, board conducts matric annual exams in March and now these days board is finalizing its result. Mainly, the final schedule of exams to the affiliated areas is issued by the authorities of board. There are large numbers of aspirants in institutes who are affiliated with this board and board supervises all the educational issues of these educational institutes. Soon after the declaration of result, students can check their matric result here on this website. All the students keep in touch with us to get all latest updates. The result will be announced in last week of July.BISE Multan also organizes a prize distribution ceremony for the students. The prize ceremony is usually held a day before the results announcement. Students are awarded with medals, shields and as well as cash prizes for scoring high marks in the exams. The toppers of the BISE Multan board are awarded with scholarships as well.